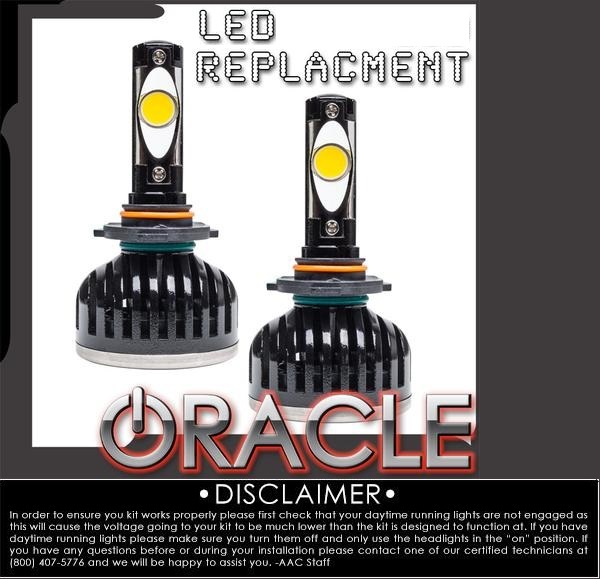 Oracle LED Headlight-Fog Light Replacement Bulbs Dodge LED Headlight Bulbs, Chrysler LED Headlight Bulbs, Jeep LED Headlight Bulbs, Oracle LED Headlight-Fog Light Bulbs, Oracle LED H10 Fog Light Bulbs, Oracle LED 9004 Headlight Bulbs, Oracle LED 9005 Headlight Bulb, Oracke LED 9006 Headlight Bulbs [Oracle LED Headlight Bulbs] - $199.95 : 3rd Strike Performance, Your Source for Late Model MOPAR Performance Parts and Accessories! Tired of issues with Xenon Conversion Kits? ORACLE LED Headlight Bulbs may be just what you need for trouble free lighting performance. These new LED Headlight Bulbs deliver excellent visibility thanks to high quality Cree CXA-1512 LED Chips and optimized reflective optics. Installation is a TRUE “Plug & Play” solution, simply remove your existing bulbs and replace with ORACLE LED Headlight Bulbs! No need for complicated wiring or relay harnesses. The LED bulbs have a built-in fan that keeps the LED cool and the fan is self-powered so no additional wiring is required. Unlike Xenon Conversion Kits, the LED bulbs do not draw large amounts of power at ignition, they only use 28W of power via a pair of14W high quality Cree LED emitters. Bulbs deliver a crisp 6,000K color output and are available in a variety of popular sizes. The ORACLE LED Headlight Bulbs are rated at an IP65 Waterproof rating. They are also dustproof and shockproof, removing the hassle of changing bulbs due to shattering.